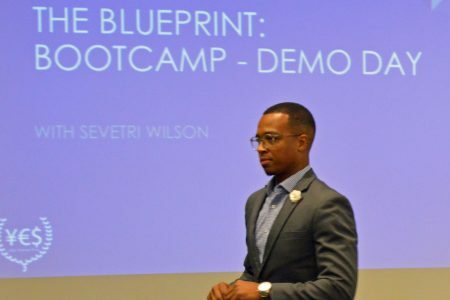 After attending a recent “Blueprint Bootcamp,” a business development program geared specifically toward entrepreneurs of color, founders of 12 companies were chosen to advance to the next stage in a process in which three will receive financial assistance. The event was sponsored by the Young Enterprising Society (YES), founded by brothers Khalif and Que El-Amin. The companies are: Like Minds, Norwood Media Group, StyleQ, 16th Place, NewWay, Root Media Company, Dino Black Studios, Anita B Mogaka Consulting, POTTY Pearls, Beneath The Surface, Trovata Box and Sekhere. POTTY Pearls, began two years ago when founder Tyeshia Coopwood went to use the restroom while at work. The toilets threw off such a horrible smell that Coopwood returned to her desk almost immediately to warn her co-workers. At the time, what started as idle office chitchat soon inspired Coopwood to create her own startup. While she and her coworkers discussed how to solve the bathroom stench without embarrassing anyone, someone recalled that Coopwood had minored in chemistry. This reminder encouraged her to begin researching and developing a product that could be both discreet and functional when it came to masking bathroom odor. Eventually, after several trials, she came up with POTTY Pearls, a small pearl that goes in the toilet before it is used. To learn how to navigate the vast market and how to move forward with her product, Coopwood applied for YES’s Blueprint Bootcamp. She was one of 57 applicants looking to fill one of the 40 vacancies. Khalif and Que came up with the Blueprint Bootcamp after speaking with Alderwoman Milele Coggs, who had recently attended a tech event. According to Khalif, there were 400 people at that event and only five of them were people of color. So YES, along with the Milwaukee Institute, Northwestern Mutual and the City of Milwaukee, decided to create the Blueprint. “We [entrepreneurs of color] have a lot to offer not only for the city but for the world,” Khalif said. The Bootcamp is the first part of the program, Khalif explained. Earlier this month, the 40 business owners gathered at Century City Tower to acquire entrepreneurial skills. 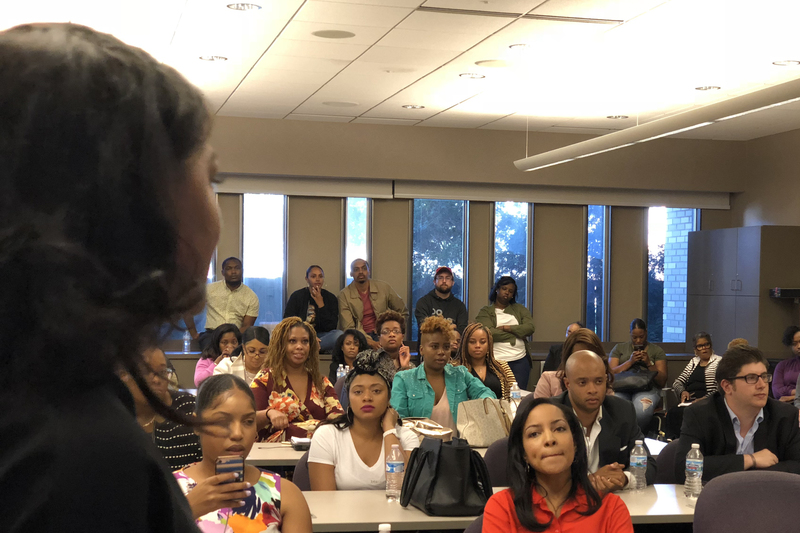 The event concluded with a talk by Sevetri Wilson, the owner and founder of Solid Ground Innovations, a consulting firm, and ExemptMeNow, an online platform that helps nonprofits get started. Wilson is noted for being the first African-American woman in Louisiana to raise more than $1 million in venture capital investments. “I knew that I had a very entrepreneurial spirit,” Wilson told the crowd. As a young adult, Wilson didn’t just want to create a business, she said, but to pave the way for people who looked like her. During her talk, she encouraged the attendees not to be afraid to release their product, because they need feedback. She also said to get comfortable with talking about money and understanding one’s budget and finances. With her first business, it took Wilson five years to make $1 million. It took her seven months to make her second million. There’s a formula, she said, and once it’s understood it’s easy to replicate. Participants also got the chance to tell the crowd their 30-second pitch. Aziz Abdullah of Root Media was met with thunderous applause after his talk. Root Media is a “complimentary digital coupon platform,” Abdullah said. First, Abdullah connects with fellow business owners to show them the benefit of data-driven marketing. Then, the company performs an assessment to determine what it needs to survive. Abdullah, who used to work as a door-to-door salesman for other African-American-owned media companies, said their techniques were outdated. He also found that people don’t like getting bombarded with questions. “Many people are working in the business and not on the business,” he said. “They don’t have time to talk to you unless you’re giving them something.” Root Media can help potential clients make a website or a logo. “Do I want to pay this bill, or do I need to put this back into the company because I believe in it that much?” he asked. Coopwood said finding balance among her startup, personal life and other endeavors can be challenging. She’s hoping that the lessons she acquired, such as learning to sell the “why” instead of the product itself, will help her in the future. It would be nice to have something like this, not necessarily for the young but many people are starting over for various reasons and could use ideas and professional development. Thank you for the feedback. The program was not limited to any age and we welcome all ages through the process. Please contact us if you are interested or know anyone interested in applying to the next cohort. this concept is interesting. I ponder if the entrepreneurs are interested in staying in MKE or branching out nationally, or even worldwide. If they are planning on staying in MKE, maybe a possibility is for someone to speak to them about co-work space, or purchasing (or leasing) space in the central city (where the entrepreneurs are needed for sure). Something to consider.